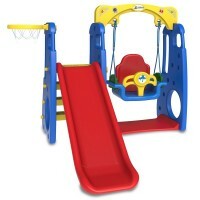 Keep your baby or toddler entertained with our range of Lifespan swings, slides and playhouses. A toddler play set is an ideal way to keep your child entertained, active and engaged. The benefits of play have been studied time and again, proving that the benefits are endless. When children play, they develop their imagination, their cognitive abilities and their confidence in a nurturing environment. Whether you’re looking for a bright and colourful swing and slide combination, a playhouse suitable for both outside and inside or an exciting slide, we guarantee that your toddler will be occupied for hours thanks to our toddler play sets available in Melbourne. The Lifespan range provides children with a fun, comfortable and safe experience during their development and will ensure hours of pure entertainment. Each of our toddler play sets are easy to assemble, and made with rounded edges which are smooth on soft, small hands. The Lifespan playhouses are recommended for children over 10 months old. Browse our range and today and find what you’ve been searching for. Endless Fun with Our Toddler Play Sets! At Go Easy, we’re proud to be a family owned and operated business since we were established over 20 years ago. We pride ourselves on stocking high-quality sporting, play and outdoors equipment for families across Australia. We have over 6,000 products available online – including stimulating trampolines and swing sets, monkey bars, cubby houses and much more. Every product we stock is at a competitive price, and if you’re not happy with the products you have purchased on our online store, we also offer an easy 14-day money back guarantee. If you’re just about ready to invest in some equipment that will offer fun and entertainment for the whole family, but you have a few questions, then we’d love to hear from you! If you have any questions about any of our products, or about our delivery service then you can call us on 1300 766 469, or simply use our simple online chat bubble on the bottom right of your screen. All new Ruby 4 in 1 Swing and Slide. Your kids can now have lots of fun indoors & outdoors wit..